USB Edge Modem offered by us is widely acclaimed for its exceptional quality and longer service life. The I2R Labs wireless modem with USB interface is based upon the Quadband GSM GPRS Module module. 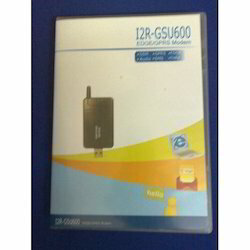 Designed for global market, is a Quad-band GSM/GPRS modem with integrated EDGE technology that works on GSM850¿¿¿EGSM900, DCS1800 and PCS1900.I2R GSU-600 provides GPRS/EDGE multi-slot class12 capability and supports the GPRS coding schemes CS1~4 and EDGE coding schemes MCS1~9. I2R GSU-600 is the ideal solution for voice, data and SMS communication.Our GSM Modem makes integration as simple as possible, primarily for users in the M2M market segment: a stand-alone device, the modem is fitted with standard USB interfaces for a power supply, an antenna, a PC, and a headset, with its plug & play technology making it very easy to put into operation.Thanks to its robust case, our Wireless Modem is ideal for use in many different business segments, such as in measurement and remote maintenance, traffic systems, transportation and logistics, vending machines, security, and building technology. We are experts in offering our clients with an extensive range of USB GSM GPRS Modem that is designed in tandem with set industry standards. This range is based on latest technology and is offered with a USB interface. It is based on SIM COM SIM 600 along with Trobriand band. We also customize this range to meet the varied requirements of our clients. Looking for USB Edge Modem ?